Hope your moving goes smoothly. We're really excited for you! Mia is too adorable. Good luck with the potty training. What are you doing with her while you're at work? Our garden is doing will .... all caught up in weeding ... thanks to Bunny's help. Daddy gets out sometimes too to hoe. I totally agree with you about FB. It's tough! Your house looks so pretty. What a great picture of the two of you. 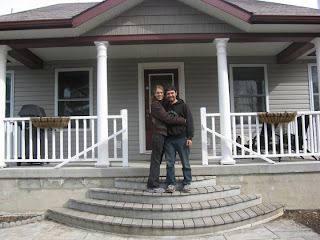 Mike and I have a similar pic of us when we bought our house in '06 with the SOLD sign out front. What a great memento to keep. It's a great feeling standing in "your own" house. I love painting and decorating. Wish we lived closer. ;) Have fun!